I remember having a boring life. Every day was the same. Wake up. Stumble to find a cup of hot tea. Feed my people. Do a load of laundry. Feed the people again. Break up a battle. Feed the people again. Hold a baby. Step on a lego. Feed the people again. Change a diaper. Read a book with them. Feed the people again. And that was just before 10:30am most days. My sweet friend decided to blog our story and share it with the world. You can read it all in one place on her blog. There is something odd to read your story, and the story of your daughter Leah, through the eyes of another, a friend, someone intimate in your life that you do life with. She started with a post I typed out fast. Through tears. Feeling sorry for myself. Trying to find words for my emotions when my days are full of crying and praying. But what caught me was the context to even how we got here. The back story. The adventure that the boys were getting earthside never imagining how that would pale in comparison for what was to come. “It has been so long since I have gotten to snuggle my girl. Everything is a trigger for tears. The mom I overhear in the hospital who says in the elevator, “we just wanted a healthy baby”. The lady who is laughing because she outsmarted the day care and, “I still dropped my kids off because they just had a cough (or little cold)”. The post with the over the top monthly picture while my daughter celebrated turning 7 months in a hospital bed hooked to oxygen. None of these things are wrong. I know I’m taking some random bits and pieces of things and internalizing them. That’s on me. None of that is directed at me. But while that mom gets to go home with her healthy baby I have to pull my big girl pants up and walk through the doors of the ICU once again. A simple cold that got passed around in August landed my kid here. And she is freaking losing the battle. And I want to scream and punch things. And all the cute posts. I see you. I celebrate your sweet babies with you. But my heart breaks and grieves for me and my baby. And how we don’t get these memories. These moments. How every dang moment feels like an uphill battle. How most people kissed their babies goodnight last night and watched Netflix and I watched an entire team fight like crazy for nearly 45 minutes to save my daughter and get her to breathe because the machine trying to breathe for her wasn’t doing its job for some reason. And all I want to do is hold this baby again. And not hear doctors conferring from multiple floors about the best plan of action. And throwing around scary words like pulmonary hypertension and nitric. If you read this and think you are barely hold on just reading it. I feel you. I am barely holding on. Also. I’m simply sharing this since I cannot possibly respond to the millions of pms. But please know we are being provided for and cared for above and beyond. Our biggest need is for prayers. We have done nothing but continued to go downhill every day. We need a miracle here.” What do you do when these are your best friend’s words? You cry, you pray, you get angry, you get hopeful, you lose hope, you scream, you sit silently…all in a span of a few seconds. It’s become my routine every time Michele messages me or I see a post from her. I hold my breath with anticipation, never knowing what kind of news I’ll be receiving. I am honored to be in the inner circle of friends receiving updates on her precious daughter, Leah, but honestly it’s hard. To truly understand the scope of what Michele has been through we have to rewind seven years to her first birth. 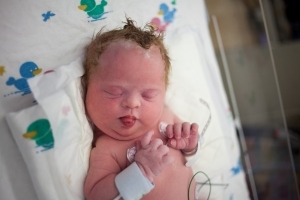 Her son was unresponsive with a five minute APGAR score of 1 and had a one week NICU stay. Her second pregnancy was plagued with the onset of a suspected auto-immune disease that resulted in partial paralysis and chronic nerve pain. Her birth, which I had the privilege to be present at, was absolute perfection. I remember her saying how thankful she was for her first traumatic experience so she could truly appreciate her daughter’s birth. Thankful. My mind was blown that those were her choice of words. Along comes her third pregnancy; another son. Her health had improved compared to her previous pregnancy and everything seemed to be pointing towards another perfect birth. Several hours into labor however a prolapsed cord occurred and an emergency cesarean had to be performed. Certainly with that much “bad luck” the odds would be to have a healthy fourth pregnancy, right? It was not even on my radar that our fourth pregnancy could be traumatic. I felt in many ways I was still suffering PTSD from my third pregnancy and 2017 had already brought chaos to the household when my husband had a heart attack in May. While I was in full baby fever mode the timing for any baby was comical. The idea of actually having getting pregnant seemed far fetched. We were still in recovery mode and figuring out life post-heart attack. But God had other plans for us, and we were surprisingly pregnant. We confirmed on the Fourth of July with shock, praise, and reserved excitement. On our best day, a fourth pregnancy, with so many little kids at home, was going to mean some extra hiccups. August 28th, 2017 Michele’s name scrolls across my phone screen as an incoming call. I knew before I picked up something was wrong. I don’t think I even said hello. “Baby is incompatible with life.” If my world was crashing down hearing those words I don’t know how she was repeating them. We talked for a while longer about how the recommendation was to terminate the pregnancy and how if she didn’t it was unlikely she would even carry her baby past 20 weeks. “Is there a heartbeat?” I asked. “For now.” “Then there is hope and you need a second opinion.” Second, third, and fourth opinions came. None were as definitive as the first which offered no hope, but none of them were great. 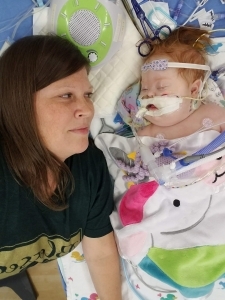 Down syndrome, congenital heart defect, and other possible complications were all in the mix now for her daughter. The longest six months of pregnancy followed. 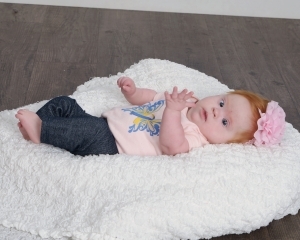 By the time Michele was 38 weeks along, doctors had given baby Leah a 50/50 chance at surviving birth, but would be unable to determine the severity of her other health complications until after birth. Every day was an emotional roller coaster. I can barely read posts from those nine months without ugly crying. Nearly every appointment was tainted with bad news. There would be a burst of great news, followed by “but”. I kept on keeping on. Fighting for life. Wanting to meet my daughter. Determined to stand for life. Wanting to know her on this side of eternity. She not only survived, she thrived! “February 17th 2018 Today God delivered the impossible. Meet Amelia Marie Grace Eastin 8:23am 7lbs 4oz 19.25 inches Amelia meaning work of the Lord. We will call her Leah because we love how she was unlikely in God’s plan and he made her central to the lineage of Christ over Rachel. Marie to have a piece of me and a bonus middle name cause shes already special so why not. Grace. We will never forget that she certainly was not promised nor deserved nor earned but totally just a gift of grace” Even with a nearly 3 week NICU stay postpartum, she was the best case scenario given all her medical conditions. She would need open heart surgery in the upcoming months to repair her AVSD and would need to be tube fed due to poor muscle tone. 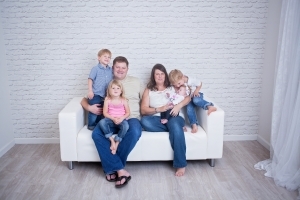 Once Leah was released from the hospital it was time to adjust to the family’s new normal. For most people this wouldn’t resemble anything like life before such a special arrival, but Michele is not like most. 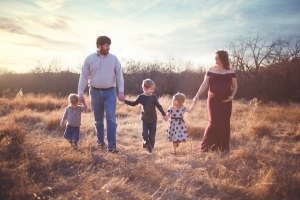 She kept life going for her three older kiddos, which included homeschooling, keeping the house running while her husband traveled for work, made it to Leah’s specialist appointments multiple times a week, and decided to open A Pocket of Joy Boutique. Yes, in the midst of everything she decided it was the perfect time to open her own business. There were moments of frustration and fear no doubt, but everything pointed to a miracle baby that would thrive beyond what anyone ever imagined. Then the bad news rollercoaster started. Days before her scheduled heart surgery Leah came down with a cold. What seems like nothing to you and I can be life threatening for a heart baby. Surgery bumped 6 weeks. Days before the next surgery date she began showing signs of infantile spasms. Surgery bumped 4 weeks Then another cold. This one landed Leah in ICU and catches us up to what they are battling now. One thing after another. Rhinovirus. UTI. Collapsed Lungs. Pneumatosis. Volatile blood pressures. And yet she keeps fighting. So what do you do when your best friend tells you “we need something! Prayers. Miracle. New lungs. I DON’T KNOW!” You write out her incredible story in your own words, words that don’t do her justice, and share it with the world. Photography courtesy of Blush Little Baby.